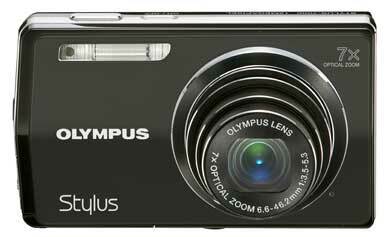 The Olympus Stylus 7000 is a handsome compact camera featuring 12 megapixel resolution, 7x optical zoom, and a large 3-inch LCD. Because it’s so light, you can slide it into your top shirt pocket and barely notice that it’s there. When it’s time to shoot, you have an array of intriguing features to help you capture the moment. For general photography, the automatic camera mode is a good place to start. The Stylus 7000 will set exposure and aperture for you, but you can customize the settings by enabling exposure compensation, white balance adjustment, and a host of other tweaks. If you prefer the camera to make more of those decisions for you, then you can switch to Scene on the mode dial and choose from 15 presets, such as Landscape, Night, Self-Portrait, or Fireworks. Select iAuto on the mode dial and the camera chooses the best shooting mode for you; it picks from Portrait, Landscape, Night+Portrait, Sport, and Macro. This sounds helpful in theory, but I think I did a much better job of determining the right scene mode than the camera. I’d stick with the automatic camera setting or pick from one of the scene mode presets. Regardless of which shooting mode you select, the Stylus 7000 uses lots of good technology to ensure snappy results. The dual image stabilization system helps produce crisp, shake-free compositions. But it also pumps up the ISO when it deems necessary, so there will be times when you want to turn it off and steady the camera by other means. Stabilizing the Stylus 7000 is important because the 7x zoom has a reach of 260mm (equivalent on a 35mm camera), which is a lot of magnification for a small camera. On the wide end, however, it’s only 37mm—a narrow field of view for a camera in this class. The Digital ESP metering system is accurate, providing good exposures. And when you turn on automatic shadow adjustment, the camera provides more detail in shadow areas and in backlit situations—a nice touch. With 12 megapixels, the Stylus 7000 certainly provides plenty of pixels for big prints or cropping. Overall picture quality was good for a compact. I was pleasantly surprised that ISO performance was decent at 400 and 800—unusual in the point and shoot category. Image noise was fairly well controlled, but with some sacrifice to image detail. Speaking of image detail, when I viewed pictures from the Stylus 7000 at 100 percent magnification, detail appeared to be only average at all ISO settings, although it is better (as expected) at ISO 64 and 100 than at 400 and 800 (and intolerable at ISO 1600). This shouldn’t be a problem for modestly sized prints, but it will be noticeable in larger output. You will probably want to apply an edge sharpening filter before printing 8.5-by-11-inch or bigger photos. The photo on the left was shot with the Stylus 7000 set at ISO 400. The photo on the right was shot at ISO 100. Click to see a larger image. A few of the special features are truly useful. The Stylus 7000 has in-camera panorama stitching that lets you meld three shots together into a single, extended-view image. My favorite of the trio of panorama modes is Combine in Camera 1. You take the first shot, then pan in either direction, slowly guiding a diamond-shaped pointer to an onscreen target. When you reach the target, the camera takes another shot. Once you’ve completed the sequence, the Stylus 7000 builds the panorama and plays it for you on the LCD. Sometimes the results were spot on; other times the stitching was a little off. But it’s truly fun and one of my favorite ways to shoot with the camera. Beauty mode is a bit more ambitious. The theory is that the camera smoothes out blemishes and softens the shadows, rendering a more pleasing portrait. You get both the original image and a beautified version at 1,200 by 1,600 pixels. Unlike an overall Gaussian filter that would soften everything in the shot, Beauty mode focuses on skin and leaves the other elements in the composition alone. You do have to wait for processing time after each shot, so it’s not for fast action fashion photography. But it does work reasonably well most of the time. This is useful for photographers who don’t want to attempt retouching in Photoshop. However, the in-camera results are not as elegant as what you could do manually with an image editor. An example of the Stylus 7000's Beauty mode in action. 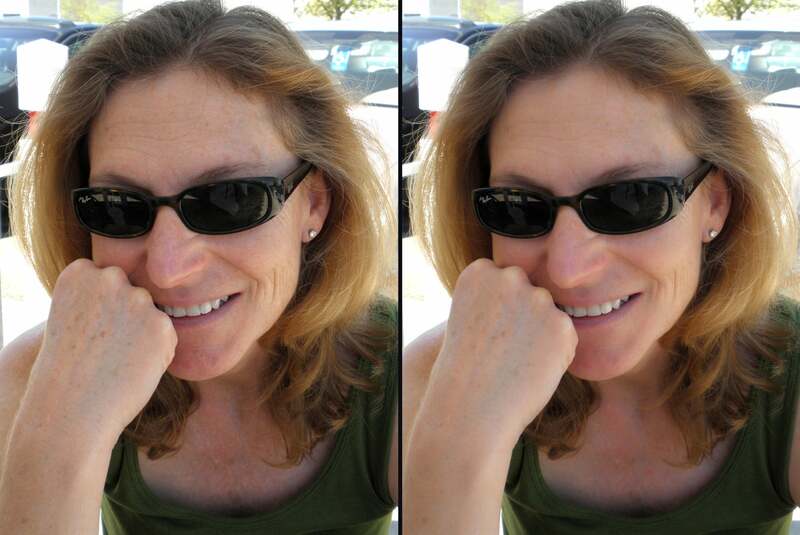 The photo on the right was shot using Beauty mode. Click to see a large photo. HDMI output lets you connect the camera to an HDTV via an HDMI to mini-HDMI cable (not included in the kit). If you plan ahead for your presentation, then you can choose between two different 16:9 resolution options when you’re capturing your images. This produces a lovely edge-to-edge display on the HD set. Olympus even provides a handful of music loops to accompany your HD slideshow. Unfortunately, the movie capture with the Stylus 7000 is only SD (640 by 480, 30 fps). HD video would have been a coup for this camera. That being said, the HD slideshows are terrific. And finally, the illuminated back panel controls on the Stylus 7000 are wonderful. Touch any of the buttons and they all light up, making it easy to find the control you want to use. This is a feature I’d like to see on all cameras. The Stylus 7000 certainly delivers in terms of style, ease of use, and a creative feature set. The 12 megapixel resolution extends the reach of an already hefty 7x zoom, but there is some compromise with image detail. This camera is ideally suited to the creative snapshooter who will take advantage of its sophisticated shooting controls (spot metering and shadow adjustment), in-camera editing options, and unique features such as in-camera panoramas, beautified portraits, HD output, slideshow presentation, and reasonable low light performance.